I had a lot of fun working on my January layout for The Scrapping Stamper. This is only the second time EVER that I've used lace on a layout. I love the soft look it gives here. I've had that lace for about 15 years, which is when my grandma passed all her sewing stuff on to me. Who knows how long she had it before then! Some of the elements are in my layout: a single 4x6 horizontal photo at the center right, a strong horizontal strip anchoring the picture, the title in the bottom right, and horizontal trim at the top and bottom. I chose not to back the picture with the circle/star, and I moved my (non-tree) accents upward from the bottom left to the center left. I skipped the journaling (gasp! so unlike me!) 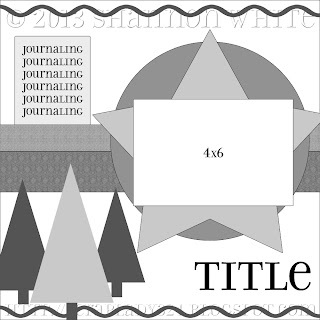 but slid a blank journaling card behind the accent strip. I really like how this turned out. I love working with sketches, keeping what works for my particular layout and changing what doesn't. But once-upon-a-time ago I used to struggle using them because I thought I had to follow them to a "T"! Since that time, many moons ago, I have learned you don't have to: the sketch is just a starting point, a way to jumpstart your creativity! The picture is very nice and the neutral colors you used work so well w/ it! The layers of lace and hearts is so pretty! Very nice!!!!! I love the neutrals!!!! Love love love this!! LOVING the colors and the hearts!!! Love how you made the sketch your own. I love the vintage lace and the muted colour palette. Such a pretty page Cindy! I love how you worked with this sketch, Cindy. I think your layout looks so soft and pretty. The lace makes such a beautiful statement here. And the fact that it was given to you by your grandmother makes is all the more special. Thanks for sharing!!!! I love the way you re-interpreted the sketch. Very pretty page and great use of lace. It's a sweet pic of you two too.